Dogs are considered to be man’s best friend, but sometimes they can cause harm and injury to us. When this happens, often times a person can be considered responsible or liable for the injuries—depending upon the circumstances surrounding the attack. 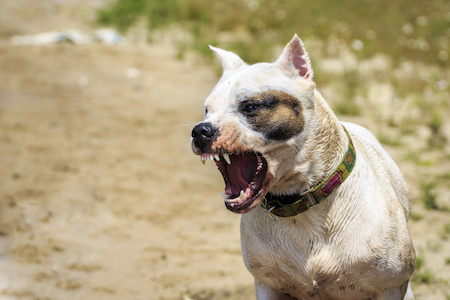 Learn more about the prevalence of dog bites, how to prevent an attack, and what to do if you’ve been bitten. Each year, more than 4.5 million people are bitten or attacked by dogs in the United States. And of those people, nearly 20% of them require medical attention following an attack. People—especially children and the elderly—can be severely injured by dog bites. Additionally, dog bites can spread germs and bacteria leading to serious diseases/infections like rabies, MRSA, or tetanus. We realize that dog bites are not always preventable (no one wants to be bitten by a dog), but there are ways to lessen your chances of an attack. First, never approach or disturb an unfamiliar dog—especially one whose owner is not around. Pay attention to a dog’s body language. If a dog feels threatened or protective, he may tense up, stiffen his tail, roll his eyes to expose more of the white, pull back his head/ears, stare intently, or start backing away. Should you notice any of these signs, do your best to stay calm, remain motionless, and then back away slowly once the dog has lost interest. If you’ve been bitten, the first thing to do is to seek medical treatment if necessary. If the wound is minor, thoroughly clean it and disinfect it at home. Take photos of any injuries and the scene of the attack. Get the contact information of the owner and any witnesses. Report the attack to your local animal control office (or the police). Then, contact a personal injury lawyer, who can advise you on how to proceed. Have you (or a family member) been bitten or attacked by a dog in the Houston area? You may be entitled to compensation for your medical bills and pain & suffering. Because each case is unique, you’ll need to speak with a personal injury lawyer to see how you can move forward. Learn more about our legal services and personal injury law below.